YOU can hear farmer Steven Peirson’s flock of fine Norfolk Bronze turkeys long before you see them. Roaming free in the fields as they forage for grasses, herbs and grubs, leaping over the hedgerows and flapping onto fences and gates, they’re a pretty vocal and lively bunch. The farm’s two collies, Spencer and Otto, can often be seen rounding wayward birds up as their high-pitched trills and characteristic gobbling calls reverberate around the North Yorkshire farmyard, close to the River Swale. With a flock that has steadily increased from just 20 turkeys 20 years ago to more than 400 today, the dogs have their work cut out. Dark-coloured, with large fan tails and red fleshy protuberances known as snoods and wattles, above and below the beak, these magnificent birds are just how you would expect old-fashioned turkeys to look. As you get closer you can see lots of rich bronzes and reds in the feathers. It’s the sort of handsome bird Mrs Beeton might have grappled with and the type of bird Scrooge might have delivered to Bob Cratchit’s house in A Christmas Carol. The Norfolk Black and Bronze were practically the only breeds in the UK in the 1800s, when – after shoeing – the flocks were driven from East Anglia down to the markets of London. Turkey was a real luxury then. With 90 per cent of the two million turkeys sold in the UK now factory farmed, this breed has become an increasingly rare sight in the British countryside. Because it has dark feathers which stain the flesh when soaked, it has to be dry-plucked, which is much more labour- intensive. Steven’s turkeys are slow grown over three months, twice as long as intensively-reared birds, then hand-plucked dry and hung with the guts intact for at least a week, for crisp skin and tenderised meat with extra flavour. A third generation farmer, Steven is one of just a handful of organic and free range turkey producers, fattening and preparing his birds the old-fashioned way in North Yorkshire. 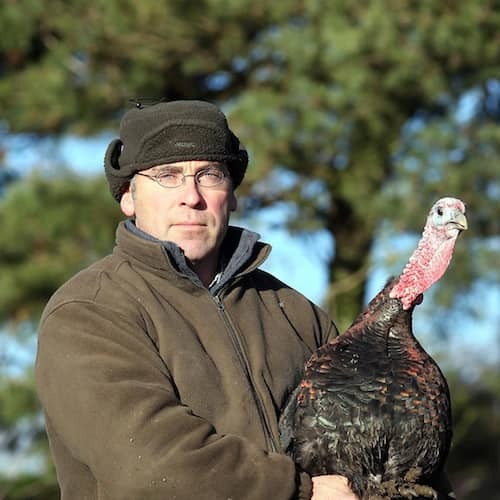 In the county he is the only member of the Traditional Farmfresh Turkey Association (TFTA), whose members conform to strict welfare standards for the 165,000 birds they sell each year, including a natural diet, free from additives and growth promoters. The turkeys of Hook House Farm certainly attract a lot of attention. Photographs of them have appeared all over the world, including on the front page of the Idaho Times-News after a photographer working for the news agency Reuters spotted Spencer and Otto rounding them up in their 20-acre field. “People often stop to ask about them, “ says Steven, as he points out the males, or stags, comically strutting about, with necks arched backwards and breasts thrust forward, as they fan their tail feathers. Highly sociable, the young birds are particularly playful as they run about in the grass, or enjoy dust baths in the dry earth. As well as foraging about freely for food throughout the day, Steven’s birds eat oats grown on the farm, which has been organic for 12 years. Unlike conventional turkeys, he farms five strains of bird, which grow to different weights, ranging from 10lb to 25lb. “People often say to me, it is beautiful, it is the best turkey ever. I like to think they appreciate having good welfare for their turkey too. Steven and wife Amanda usually have about 15 family members for Christmas dinner, including daughters Sophie, 16, and Emily, 15, and will get through two or three of their own 20lb birds over the festive period. “When you see the grown-up birds, nice and chubby, with feathers in place, it’s very satisfying. For information about how or where to purchase your Christmas turkey please complete the form below.